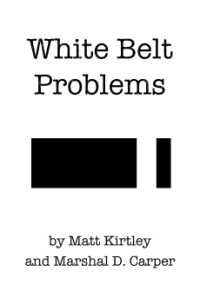 Home » White Belt Problems » Is it normal to be extremely sore after training BJJ? Is it normal to be extremely sore after training BJJ? Yes, it is normal to feel pretty beat up after Brazilian Jiu-Jitsu class. The stresses of warm-ups and sparring are more intense than anything a normal person goes through in their day to day life. If you’re training hard, you will feel sore after every session, but especially during those first 6-12 months. The good news is that your body will adapt as you get in better shape and become more accustomed to BJJ. You should be using less strength as your technique improves, which will give your body a break. A lot of the soreness beginners experience comes from forcing moves, panicking and freaking out when they are in bad positions, and tensing up and breathing poorly. For more tips read I gas out and get exhausted really fast when I spar. What can I do? To reduce soreness, do a good warm-up before you train. In the time while everyone else is sitting around making awkward small talk before class, don’t do idle static stretches like touching your toes and pulling your elbow across your chest. Modern sport science recommends active stretches and moving through ranges of motion before physical activity, not just seeing if you can touch your nose to your knee. Static stretches are better for after class and on your days off. If it really comes down to it, you can look into ice baths, painkillers, anti-inflammatories, and RICE (Rest, ice, compression, and elevation) for injuries. Stretching and staying loose throughout the day when you’re not training is very important but often overlooked. A lot of jiu-jiteiros recommend yoga, and a few lucky BJJ gyms also offer yoga classes. (See Is yoga good for BJJ?) If you sit at a desk all day, take breaks to get up, stretch and walk around. I also highly recommend looking into self-myofascial release (SMR) using foam rollers and lacrosse balls, PNF stretches, active/dynamic stretches, etc. Crossfit instructor and physical therapist Kelly Starrett’s Mobility WOD YouTube videos and book Becoming a Supple Leopard teach this approach to stretching and mobility. I do these before and after each class, and throughout each day, and they have helped more than anything else.